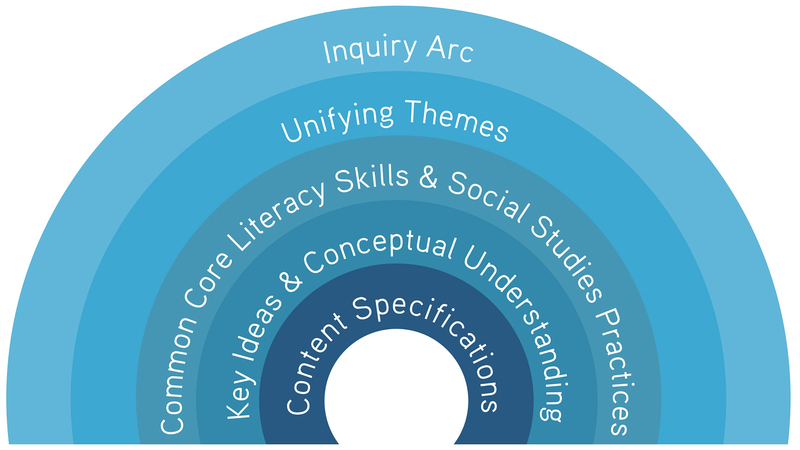 If you dive into the Inquiry Arc, you can see that content is still at the heart of what we do. What has changed in social studies instruction since the release of the New York State Framework is that there is a more concerted effort to teach history through the lens of big picture connections over time, which is in fact a central feature of the BHP narrative. Although social studies education has long deemphasized rote memorization and getting bogged down in minutia, New York State has made a commitment to redesign their assessments to test for application of knowledge, rather than more traditional assessments that rip facts out of context. Due to these redesigned assessments, which focus more heavily on historical thinking and skill development, the time couldn’t be riper for the integration of the BHP curriculum. Current eighth-graders in New York State will be the first cohort to take this redesigned test, which focuses on world history from 1750 to the present. This leaves a vacuum in ninth grade in the current course of study, global history, and geography I. Although this content will no longer be directly assessed, New York State is maintaining that Global 9 will provide a foundation and the background knowledge to better understand the second half of the course taught in tenth grade. What we have seen firsthand is that the BHP World extension is strongly aligned to the New York State Social Studies Framework. The BHP course focuses on skills development and strengthens students writing and reading comprehension. The course perfectly aligns with the C3 shifts, beginning with the assertion that inquiry is at the center of teaching and learning. Interdisciplinary connections leverage the power of teaching a more complete narrative, weaving in insights from various courses of study so that subject knowledge is no longer in a vacuum. BHP supports the authentic application of knowledge (taking informed action). Students will be equipped to solve the problems of today and the problems that don’t yet exist by becoming out-of-the-box thinkers. Ultimately, the BHP World extension will instill in students a skillset and framework for thinking and learning that will prepare them for the redesigned New York State Regents exam. Students will experience a more engaging and dynamic course through the lens of Big History, because BHP’s true interdisciplinary nature leads to a richer dialogue in class, and a more cohesive and interconnected narrative.